"How can ESP be called a science, when there is no scientific proof that ESP exists?" By 1970, the bright days of the Hollywood musical were all but extinguished. Barbra Streisand, making the move from Broadway to features with the just short of brilliant Funny Girl and Hello Dolly, would enter the '70s with a divergent career—the farcical The Owl and the Pussycat and On a Clear Day You Can See Forever, an adaptation of Alan Jay Lerner's moderately successful play. For director Vincente Minnelli, the man behind Meet Me in St. Louis, An American in Paris, Brigadoon, and Gigi, this would be his musical finale, and an odd one it would be. Streisand plays Daisy Gamble, a spinny young lady who has extraordinary psychic powers, but is content to submit to her dweeby fiancé's (Larry Blyden as Warren Pratt) conformist plans. Hoping to cure her five-pack-a-day smoking habit in time for an important dinner engagement, she seeks out the help of Dr. Marc Chabot (Yves Montand), a leading hypnotherapist, but while attending his lecture, Daisy is accidentally regressed, and Chabot first discovers her abilities. Sceptical at first, he becomes intrigued by the alternate personality, Melinda, he uncovers while she is under hypnosis, a woman who bears no similarity to the girl in his chair. He begins to be convinced he has found proof of reincarnation, but also develops an attraction for this alter ego. When news leaks of his discovery, the entire institution is besieged with controversy. Unaware of Chabot's research, and believing he has more than a casual interest in her, Daisy finds herself attracted to the doctor, despite her engagement, and Chabot tries to reconcile the woman of the present with the echoes of the past. At first I had my reservations, but this is one film that requires a second look to fully appreciate. Opening with an amazing time-lapse sequence set to Hurry! It's Lovely Up Here and dizzying titles, the production is grand, with the flashbacks bathed in period splendor. Streisand is radiant, excelling in her multiple roles in all but the smallest details. The first half of the film is sparse musically, building the backstory of Melinda, but its frequency increases in the second half. The songs by Lerner and Burton Lane are fairly strong, and Streisand handles them expertly, including the playful Go to Sleep in which she sings a duet with herself. Montand is somewhat awkward, partly due to some weaker material, but still does a good job. A young Jack Nicholson plays Daisy's hippie half-brother, with Bob Newhart as the school's conservative head, and Blyndon is great as Daisy's geeky boyfriend. The film was originally intended as a three-hour roadshow, but was shortened to its current length due to the waning interest in the genre at the box office. The decision also left the bulk of Nicholson's performance—including a musical number—on the cutting room floor. 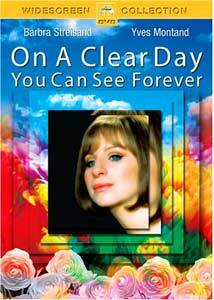 If you aren't already a Streisand fan, this isn't the film to win you over. For those who are, Babs is a tour de force, laying it on whether playing the mousy Daisy, or the seductive Melinda. There are flashes of her future comedic form and trademark mile-a-minute dialogue. The costuming is all over the map, from the ultra-mod 1960s garb to the sultry dinner dress she uses to entice her future (past) husband. While it may not live up to some of her other work, On a Clear Day... is certainly not a film one is likely to forget. Image Transfer Review: Paramount delivers On a Clear Day... in a nice new anamorphic transfer. Colors pop off the screen, vibrant and well defined, with solid black levels. Grain is moderate, retaining its film-like quality. Source defects are limited to minor debris. Not quite pristine, but very good looking. Audio Transfer Review: Audio is presented in both 5.1 and mono English. The surround track fills out the soundfield without being overly directional, with a good tonal balance, and clear dialogue. The mono track is less ambient and more limited in range. A French mono track is also included. Extras Review: There are no extras aside from the 25 chapter stops. Paramount presents On a Clear Day You Can See Forever in a respectable, but bare bones edition, and Barbra steals the show. Recommended primarily for Babs fans, but also for musical buffs looking for something unusual.